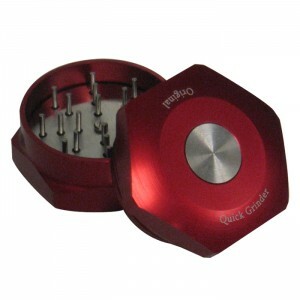 We present our most valued treasure: The Original Quick Grinder, the fastest, and easiest crushing tool of the market. Quick Grinder, with it's own registered system to take the herbs out, will beat competitors. Fastest and easiest than any other, doesn't need magnets to keep it closed. Put your herbs in, turn it on, open it, push it's buttons and voilà. Quick Grinder represents the option for those who want the best tool to keep it forever. Aluminium gives a cool look and a long life usage also. Find it in Blue, Green, Red, Grey, Silver and Black to get the one that fixes better with your lifestyle. Simply the best grinder ever.